Welcome back, crafty friends! 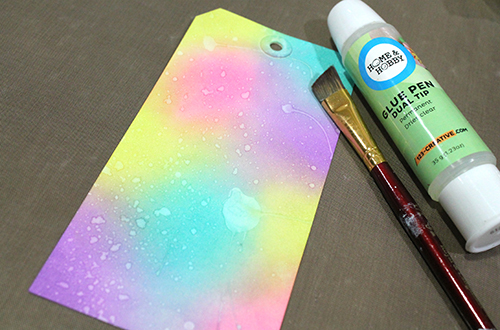 Let’s get messy and have a little mixed media fun with this Discovery tag using the Dual Tip Glue Pen. Sometimes you just feel like getting a little messy. Let’s get out those sprays, mediums, glitters and more and get crafting. 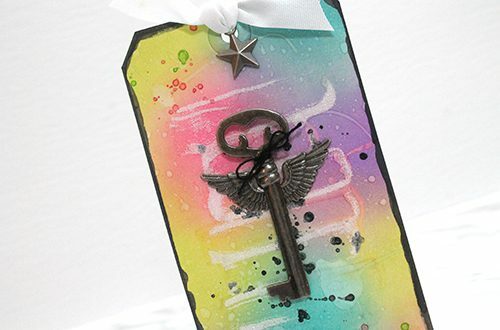 Here are all of the messy details and instructions to create this Mixed Media Tag. 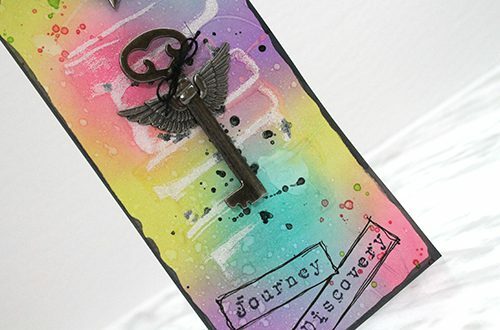 First I took my large tag and created a simple blended background using various colors of inks. I used water to splatter the tag and dried it with a heat gun. Then comes out the Home Hobby by 3L Dual Tip Glue Pen and a paintbrush. 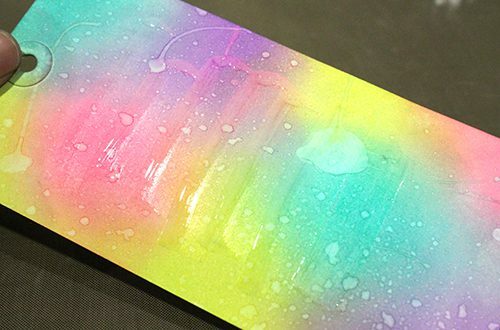 I added a pretty good glob of the liquid adhesive from the Dual Tip Glue Pen onto my non-stick craft mat. Using my flat edged paintbrush I brushed strips of the adhesive across the body of the tag. You can see in the photo below, how the adhesive even altered the color slightly, which I loved. While the Dual Tip Glue Pen liquid adhesive was still wet at the edges of the brush strokes, I added a white glitter mix for some sparkle. Let dry. 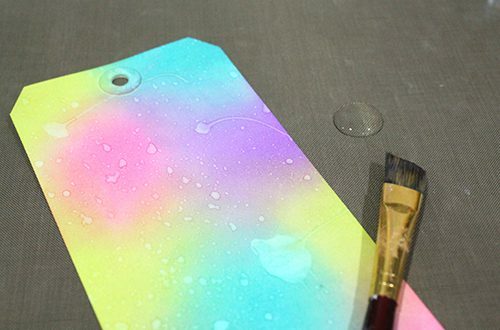 Once this was dry, I then added splatters of color to the tag from coordinating misters. Then dragged the edges in watered down black ink. I added a simple white linen ribbon bow to the top of the tag adding that sweet little metal star embellishment. I added black burlap string to the key then added the key using 3D Foam Squares White Small and the metal wings to the tag using Adhesive Dots Mini. Finally, I stamped the words Discovery and Journey onto the tag using black ink and outlined them with a black journal pen. This entry was posted in 3D Foam Squares, Adhesive Dots & Lines, Adhesives, Crafts & Tutorials, Embellishments, HomeHobby by 3L, Intermediate, Mixed Media, Other Adhesives, Permanent Adhesive, Skill Level, Tutorial, Wear your Adhesive on the Outside and tagged 3D Foam Squares Mix White, 3D Foam Squares Small White, Adhesive Dots Mini, Dual Tip Glue Pen, Glitter, HomeHobby by 3L, Mixed Media, Tag, Tracy McLennon, Tutorial, Wear Your Adhesive on the Outside. Bookmark the permalink. 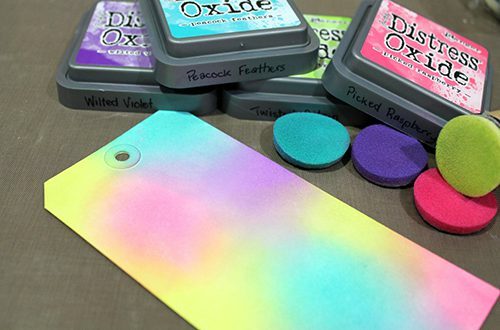 One Response to "Discovery Tag – Mixed Media Using the Dual Tip Glue Pen"